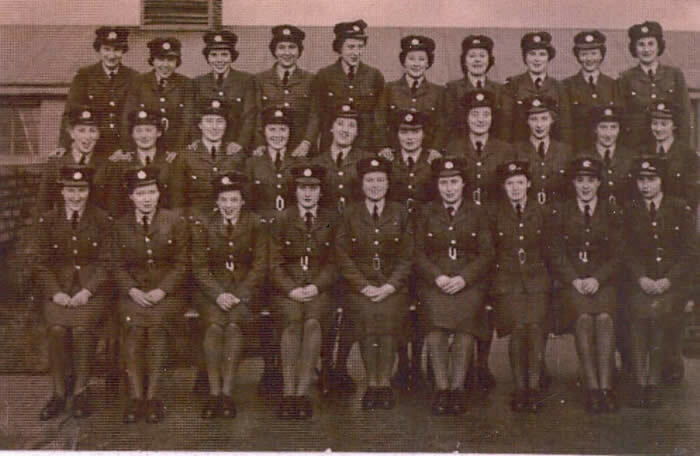 On this page, you can read about the Women's Auxiliary Air Force and Land Girls. Our Nissan huts were literally in the middle of a field and the station was about a mile down the road. There were probably about 7 people and the mechanics on watch at any one time. We were looking at a screen like a TV screen with a zig zag line and from that you could tell where the aircraft were, how far away they were and you could get their direction and also their height. So, someone was sitting looking at that, someone else was relaying the information through to Fighter Command, someone else was logging it in a book. We had a map on a table; perspex with a light shining through it and this was really very trying on the eyes especially in the middle of the night when you had been on duty for several hours. Someone tracked the aircraft on the map with a china graph pencil. We were controlling the planes. I was working on “oboe,” in fact. A little bit of mathematics. The intersection of two arcs give a pin point and that’s where you tell them to drop their bombs or their markers. There were two stations, ours and one on the Norfolk coast and we worked in partnership. One tracked the pilot and sent out beams when he got near the target and tracked him onto it. If he deviated from the track he got dots on one side and dashes on the other. A steady note meant keep going on this course. Meanwhile the other controlled the navigator and did the same thing. As soon as he got the signal he pressed the button (and released the bombs). We’d worked it all out with paper and pencil and slide rules beforehand. I felt no particular guilt about what I was doing. It had to be done to win the war and it concentrated the attack on one particular spot. It was not a personal thing. Although we did meet some of the air crew when they came to see what we were doing, the job was all done at long distance. All the radar operators were women. We were a bit miffed because later on some of the men who were trained as operators were to go once the invasion (D-day) happened. They were to take the mobile units over and work from there. We thought; dash it all, we had been doing it all these years. Why can’t we carry on but they wouldn’t let us go. Read more from Patricia Daniels on school life here and on the WAAF here. joined the WAAF at the start of the war. She worked her way up the ranks, as a secretary and as a Flight Sergeant went to Paris with General Eisenhower when he moved his headquarters to the continent. She was posted to Field Marshall Montgomery’s headquarters in Germany. For this move she was ‘mentioned in dispatches’ being one of the first two British women to cross the Rhine. She was actually there and saw the German generals surrender the North German Armies to Field Marshall Montgomery. It was quite a big job. Actually, it was a very busy switchboard I was on, taking all these calls. It was very interesting. I didn’t go overseas because you had to have permission to go overseas and I was underage. My parents wouldn’t let me. My brother was out there and he said no. I chose the WAAFs because my brother Bill was in the RAF. ...the atmosphere was great there. You had some good times at the camp. We went to the cinema – it was good times really. Then the Americans came over and we had dances and invites when they let us out. Hylda Maslen's WAAF Flight. Hylda is in the centre row, second from the left. We were threatened once that there would be an invasion. I was at the switchboard. We had to break all the machinery up and destroy everything. I thought, “What if I do that and it’s a false alarm?” So I didn’t. It was a bit scary. Read more about Hylda Maslen's experiences here. 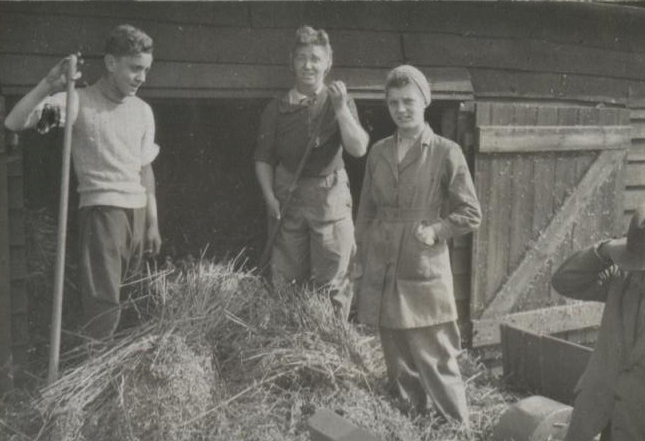 We had 2 Land Girls working for us after 2 years, Phyllis Griffiths and Pat Adderley. Very, very good they were. What I could never understand – you can picture the old-fashioned, grumpy farm labourers – and they got on so well together. I put it down to the girls had got enough sense that when the old boys offered advice that’s what they were doing, not finding fault with them and in the end they became quite proud of each other. The girls did all the dirty jobs because they were the less physical jobs. These old boys, (the farm labourers) if they could help them, they would. Another thing. They brought in a regulation that army camps in the area had to send a certain percentage of their men to work on the farm. Well, if you had the same two men all week you paid their money to the army but if you had different men each day on their day off they could keep their money which was more popular. One day we had a very cocky PE instructor who tried to impress our land girls with the speed of his work. Our two girls soon had him on his knees. He found out he had muscles on that day that he didn’t know he had. We were very proud of our land girls that day. Read more from John about Land Girls and farm life here.